Sorry for my absence – my interests lately have run to 3D printing (yes, including firearms! ), which is a bit off the topic of this blog. I also have not had much time to go shooting with the kids’ school year picking up. Rest assured that I still plan on posting, perhaps with less frequency. As shown on Facebook (h/t to the TheFirearmBlog for reminding me to post), Recover Tactical is developing Browning High Power grips. Presumably, these will fit guns with curved trigger guards like true BHPs, Kareen Mk1s, and FEGs, but probably not the guns with square trigger guards like the Kareen MkII/III, KA-III, and the Arcus guns. Next in line are apparently Makarov grips, which strikes me as a bit nonsensical – FAB Defense has a good solution already, and how much of a market is there? IMHO, there’s a huge opportunity in producing TA-90 and CZ-75 grips, given how many beat-up old guns are on the surplus market now. IWI-US released a statement on Facebook that the .300AAC conversion kits for the X95 and SAR are being released soon. Complete 300AAC X95s will be coming out in “end of February, early March”. X95 conversion kits will be available in “end of march, early April”. And, finally, we’ll see SAR conversion kits at “end of April”. Finally, the CAA Micro RONI has been released, and, shockingly, it’s really rather reasonably priced at $250 for the base model. Jim Grant has a review, and he seems to like it – with the usual caveat of “your Glock isn’t a rifle even in a chassis”. Besides their foray into the AK market, CAA’s SHOT 2016 booth also revealed a new Glock chassis called the “MIC-RONI”. I think you are supposed to pronounce this “Microni”, like “Macaroni”, but they also call it the “Micro RONI” on their site, so… your guess is as good as mine. The trigger-blocking safety looks much more manageable – doesn’t look like there’s a button to deploy it. it has storage for an extra mag in the fixed VFG. The stock is high enough to support AR optics properly. Integrated flashlight holder (albeit I don’t know what it’s compatible with, or how you control it). Downside is that it doesn’t look like you’ve got enough clearance to run a suppressor. That’s not a deal-breaker for me, but could be for other people. Phil at TFB has the scoop on the just-announced Hartman Optics MH1 Reflex Sight. Bizarrely, no one notices that this sight is very similar to the MSE-AQC sights that CAA was selling a couple years ago, also designed by Mikey Hartman. Optic control via PTT cable, German-post-esque reticle, huge window, etc. The MH1 seems to improve on the MSE-ACQ by dumping the switchable reticle in favor of motion-sensing on/off and USB charging and brightness configuration. While the USB recharging is a bit of a gimmick, customizing the sight’s brightness levels and other settings via USB is a clever idea that could be the next big thing. Street price is going to be the make or break, I think. You can buy the Mepro Tru-Dot RDS at Amazon for $335, which is really a terrific deal for a combat-grade reflex sight. It is really unclear to me that anyone is going to spend 50% more on a sight without that sort of heritage. I just don’t think I’d spend $150 more for a slightly fancier reticle and USB configuration. 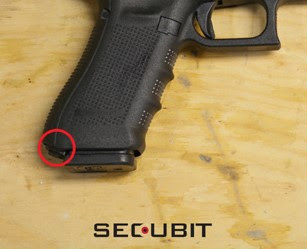 CAA USA is now distributing the Secubit GSC Gun Shot Counter for Glocks (which I will just refer to as a GSC). Secubit is an Israeli firm which manufactures GSCs for the Glock and picatinny-rail-equipped rifles. It costs $100 for the Glock Gen3 version. I’ve noticed a lot of whining online about “why would you need this?” I think it’s a rather useful tool for setting and complying with a maintenance schedule, not to mention understanding your shooting habits in more detail (such as split times). Whether it’s a hundred bucks useful… the jury is out. It would be a no brainer to me at a quarter of the price, but I’d need to be using it on a serious-competition race gun to justify spending a hundred bucks on it. I think there’s real merit in computerized statistics for firearms, and would like to see more hardware innovation in this area.